Hotel, Conference, Parking – All Under One Roof! 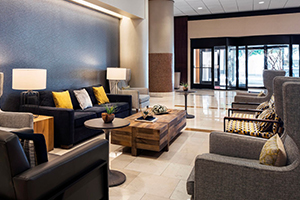 Located in the heart of downtown Oakland, and in the geographic heart of our membership, the Oakland Convention Center is a world-class exhibition hall attached to the beautifully remodeled City Center Marriott. The Convention Center is easily accessible by all major freeways, has onsite parking, and for those wanting to explore downtown San Francisco, the Bay Area Rapid Transit station is located right across the street and can take you there in only 12 minutes. We’ve reserved a block of rooms for HR West attendees at the City Center Marriott. Conference rates are $242/night. Conference rates expire on February 16th so book now! Click HERE at our HR West conference portal to get the conference rate or call (877) 901-6632 and ask for the HR West rate. 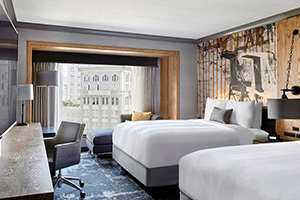 Check out the general hotel site here: City Center Marriott. It has come to our attention that someone has been calling HR West sponsors and exhibitors offering fraudulent hotel rooms. As a friendly reminder, the only way to receive the discounted hotel rate is by contacting the hotel directly or booking online using the secure link above. If you have questions about making hotel reservations, please contact the Oakland Marriott at (877) 901-6632.